Are you one of the many consumers that see a Going Out of Business Furniture Sales sign and rush to grab a bargain? If you are, and even if you are not, use caution because not all going out of business sales are what they are supposed to be. Store owners know that "Grand Opening" sales and "Going Out of Business" sales typically bring in the most business. In turn, shoppers know that they are going to get good prices and great deals at both types of sales events. At most grand opening sales, the store owner wants to build a happy customer base by offering good prices. Repeat customers and good recommendations are important for a successful business. At a going out of business sale, the store owner wants to liquidate his merchandise while cutting his losses as much as possible. In many cases, store closings are handled by the actual store owners. These types of store closing sales provide the best opportunity for shoppers to find furniture bargains on small sectional sofas, wing back recliners and other types of furniture. Generally, shoppers can make package offers on several pieces of furniture for even better prices. 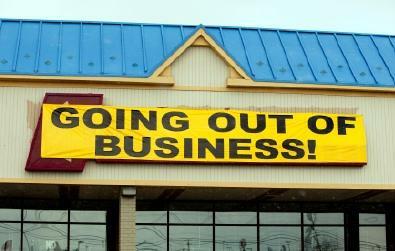 In many other store closings, the going out of business sale is handled by a liquidation company. In this type of store closing, the store owner hires an outside company to run the sale. It is the job of the liquidation company to sell the store's inventory while making the most money for the store owner. Posting a high regular retail price so they can show a deep discount - This technique often results in the sale price being higher than the original selling price of the item. Salespeople use the urgency close which is a high pressure selling technique. Throughout the country some furniture store owners run a going out of business sale that lasts for months, or in certain cases, for years. Perhaps you have seen a giant costumed gorilla, a chicken or a young employee standing on the side of the road holding up the sign advertising the sale. Once they have gotten your attention, you cannot help wondering what is inside the store. You find yourself drawn to the fantastic values promised inside. Naturally, many of these store closing sales are legitimate as stores succumb to the slow economy. However, there are also some store owners that are using the going out of business sale as a scam. As a way of making consumers believe they are getting low prices and a great deal. In reality, these stores are in the business of going out of business. Many states require a Going Out of Business permit. If it is not visibly displayed, ask to see it. Going out of business furniture sales can be a great place to find excellent bargains for all types of indoor and outdoor furniture. However, you must always take the time to be a smart and informed shopper.